Father Emilien Tardif (1928-1999) - the well-known French Canadian preacher of the Catholic Charismatic Renewal and for many years a missionary in Latin America - is often mentioned as having recognized Vassula's "charisma". This statement is based on an interview given by Father Tardif to the Italian journalist Marino Parodi and published in the magazine Il Segno del Soprannaturale (October 1996). The interview has been reproduced on several websites promoting the seer's case (1). 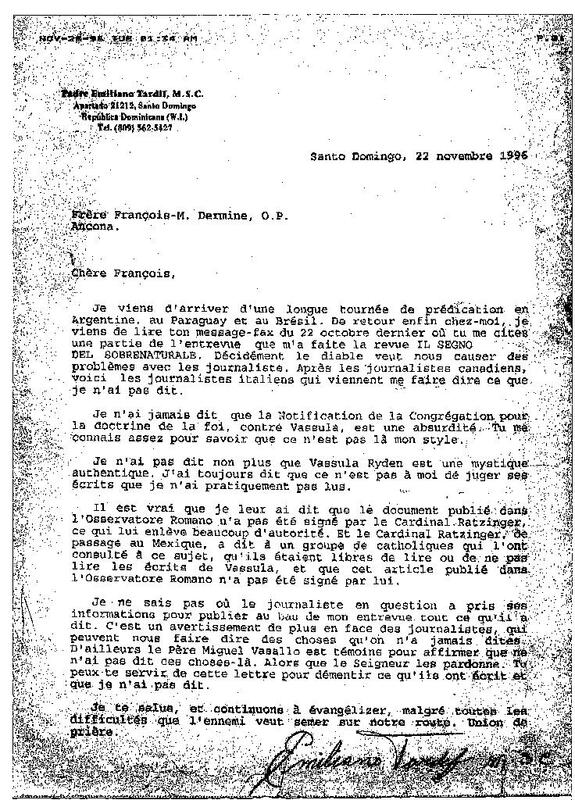 When the interview was published for the first time in 1996, Father François-Marie Dermine o.p., author of a critical analysis of Vassula's writings (2), contacted his compatriot Father Tardif. The words which had been attributed to Father Tardif in the interview seemed strange. They were not consistent with the opinion he had voiced on Vassulas writings to Father Dermine in a previous meeting. Nor did I say that Vassula Ryden is an authentic mystic. I always said that it is not for me to judge her writings, which I have barely read. It is true that I said that the document published in the Osservatore Romano wasn't signed by Cardinal Ratzinger, and therefore its authority is lessened. It is also true that I said that Cardinal Ratzinger, while visiting Mexico, told a group of Catholics who had consulted him regarding this matter, that they were free to read or not to read Vassula's writings, and that the article published in the Osservatore Romano had not been signed by him (...)"
Note: These words attributed to Cardinal Ratzinger were officially denied by the Vatican (2). Father Tardif was citing in good faith an inaccurate Canadian source, which had published those declarations. At the end of his fax, Father Tardiff authorized Father Dermine to use it in order to reestablish the truth. On 28 December 1996, Father Dermine read the fax during his program broadcast on Radio Maria Italy. A few weeks earlier, the Congregation for the Doctrine of the Faith had published a press release (30 November 1996) reconfirming the validity of the Notification against Vassula and announcing its publication in Acta Apostolicae Saedis with Cardinal Ratzinger's signature. The press release also denied the words that had been attributed to Cardinal Ratzinger in Guadalajara, Mexico (3). At the beginning of 1997, Il Segno del Soprannaturale published a new article, in which Father Dermine and Radio Maria were described as "denigrators" and "persecutors" of Vassula, and affirming that the content of Tardif's fax did not correspond with what he had said during the interview he gave to Marino Parodi for his book "I Doni dello Spirito e la Nuova Pentecoste", which was on the verge of being published. Indeed, shortly after, the book was released containing the words that Father Tardif had denied. It is however interesting to note that Parodi published that same year a book entirely dedicated to Vassula (4). Although he named all the Catholic personalities who recognized Vassula's "charisma", he didn't mention Father Tardif nor the interview in question. Moreover, Parodi omitted any information that could be damaging for Vassula, to the point of not even mentioning the Vatican Notification. To this day, Parodi's interview is used to promote Vassula writings among Charismatic Renewal groups. We encourage the readers to disseminate Father Tardif's fax, together with the above explanations, as he had himself requested, in order to reestablish the truth about his opinion on Vassula's case. (4) PARODI, Marino. 1997. Vassula Ryden: mistica e profezia alle soglie del 2000. Edizioni Mediterranee, Roma. I've just returned from a long preaching "tour" in Argentina, Paraguay and Brasil. Finally back home, I've read your fax message dated 22 October, in which you cite an extract of the interview of IL SEGNO DEL SOPRANATURALE (sic). Undoubtedly, the devil wants to cause us problems with journalists. After the Canadian journalists, here come the Italian journalists making me say what I haven't said. I never said that the Congregation for the Doctrine of the Faith's Notification against Vassula was absurd. You know me sufficiently well to realize that it is not my style. Nor did I say that Vassula Ryden is an authentic mystic. I always said that it is not for me to judge her writings, which I've barely read. I don't know where the journalist in question found his information so as to publish at the bottom of the interview all what he wrote. It's another warning about journalists, who can make us say things that were never said. Amongst other things, Father Miguel Vasallo is a witness who can confirm that I never said those things. So, may the Lord forgive them. You may use this letter to deny what they have written and that I haven't said. Take care, and let's continue to evangelize, in spite of all the difficulties that the enemy wants to sow on our way. In union of prayer. [*]Translator's note: These words attributed to Cardinal Ratzinger were officially denied in a press release of the Congregation for the Doctrine of the Faith dated 22 November 1996. Father Tardif was citing in good faith an inaccurate Canadian source, who had published that information.